For those looking to kill a bit of time online and learn some cool things, read on. Wikipedia‘s pretty helpful in understanding that term better, but for now just know that ginger is an example of an underground rhizome. 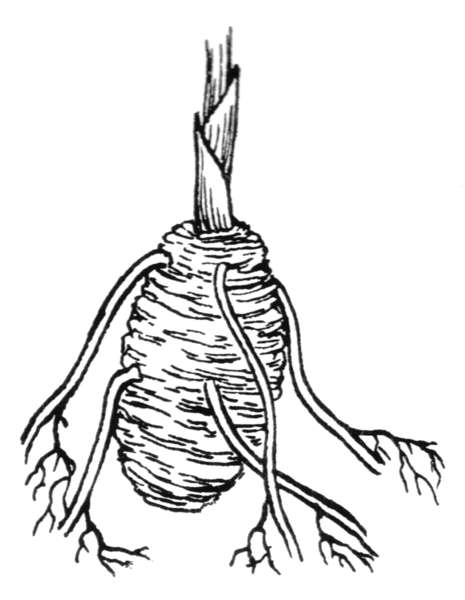 It sends out roots and shoots from its nodes. Usually these are sent creeping out underground. One of the cool things about rhizomes, especially for farmers and flower-growers, is that rhizomatic plants can be multiplied by a process called “vegitative reproduction.” That means, you can chop a piece of a rhizome off, plant it, and it’ll grow into a new plant. How cool is that? According to wikipedia, you can do this with plants like ginger and asparagus and flowers like irises and lilies-of-the-valley, and certain kinds of orchids. Meanwhile, this term “rhizome” also has crept (that’s a pun, see?) into philosophical and theoretical discussions of culture, primarily because of the writings of Gilles Deleuze and Félix Guattari, who discussed it in their two-volume study Capitalism and Schizophrenia. They borrow the botanical concept to discuss different ways of understanding things and theorizing about things. Rhizomes shoot out in all directions and connect in interesting ways. You can examine a part of one of the shoots and see where it connects and branches out into other things. Deleuze and Guattari contrast “rhizomatic” with “arborescent” thinking. And “arborescent,” of course, is a reference to a tree-like structure. See, trees have a bunch of underground roots, too, but they’re connected upward to a tree. It’s a linear, hierarchical structure. Roots go down, tree goes up, and most people focus on the tree, not the roots. Postmodern theorists dig this concept as a way of highlighting the differences in structure between modernist works and postmodernist works. In Postmodernism for Beginners, an awesome graphic novel-esque overview of postmodernism, author Jim Powell talks about how the ideas of sampling, parody, and pastiche–all of which are popular postmodern “strategies”–are examples of the rhizomatic nature of postmodern culture. Rather than follow a straight-forward, linear, hierarchical pattern toward a single idea like more traditional narratives do, postmodern narratives–like rhizomes–often branch out in multiple ways simultaneously, touching on or quoting other works, digressing along separate paths, connecting to other ideas, and sometimes, but not always, reconnecting with the original root stalk at some point. So this is sort of how I experience the internet. You too, maybe. I find one thing and I click on it. This leads to another thing, tangentially related to the first thing. Then I click another link, which takes me somewhere else, and so on and so on. After several hours of clicking and following links in a non-linear way I suddenly find myself reading about something and have no idea how I got there. 1. I taught at a college in California for a while and met a bunch of students. 2. Some of them were friends with a guy I don’t think I ever had in one of my classes, but he was a cool guy. (That guy, in this case, is Jeff Lepine. He has a website called mindblowingwonderfulness.com). 3. Somewhere I added him as a friend on Facebook, so he occasionally pops up in my FB news feed. Like today, for instance. He was announcing a cool theatre thing. 4. So I follow his FB post to his FB page. 5. I look under his Info tab to see where’s he’s at currently. 6. I discover his aforementioned website. 9. Emily recently wrote a post about George Clooney and his hatred of Facebook. 10. While looking at Emily’s blog, I remember how she once gave one of my posts a shout-out in one of her posts. 11. That post of hers had such an impact on my blog’s traffic that I wrote a blog post about it. To this day, I still get more hits on that Justin Bieber post than anything I’ve posted. 12. Thinking about that made me realize I haven’t posted in a while and I should probably put something quick up here. 13. So, here I am. This all started cuz Jeff posted a thing about theatre on his Facebook status. And now I’m talking about Justin Bieber gossip. AND that, my dear readers, is an example of RHIZOMATIC AWESOMENESS. This entry was posted in Cultural, Personal, Uncategorized and tagged Emily Trainham, Facebook, George Clooney, ginger, internet, Jeff Lepine, Justin Bieber, language, popular culture, postmodernism, rhizomes, unicorns. Bookmark the permalink. I’m using this entry next time I get to explain postmodernity to undergrads. Also, “Hyperbole and a Half” is delightful. I have a website where I write stuff about philosophy from Plato to Slavoj Zizek, and was looking to talk more philosophy about Deleuze, so I was reading A Thousand Plateaus finding myself confused as to what this biology about the rhizome had anything to do with philosophy of Deleuze and Guattari. Your explanation really helped me out. Great – thanks – looking into this and I like the connections made and how the concepts are given some clarity.